984 acre +/- tract For Sale in Iron County, Missouri. As larger contiguous parcels become more difficult to find this farm represents a rare opportunity to own mixed use residential, recreational, ranch-land in the Missouri Ozarks with direct highway access. 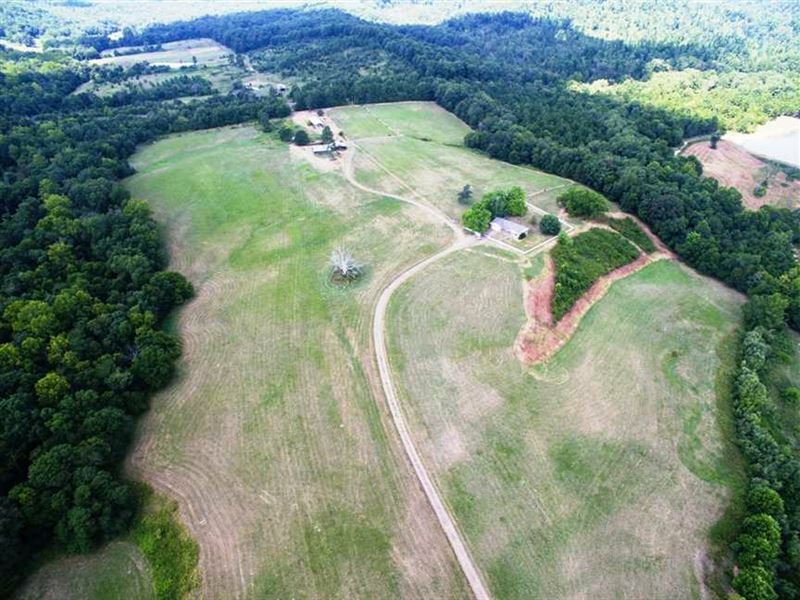 Great mixture of pasture and wooded acreage as well as a large 7 acre spring fed pond and even your own mountain, Ruble Mountain The improved pasture ground has been set for livestock, with perimeter and cross fences as well as stock gates at the main crossing. There are stock sheds and barns just to the West of the home that offer a variety of uses for the owner. Built in the mid 60's, the 3 bedroom brick home has an attached garage and covered front porch facing the Eastern entrance to the farm. Laminate floors, stone fireplace, cedar lined closets, central air, outdoor wood furnace, and more all functioning on a deep private well. As you look around you envision the many uses of the property. Beautiful places to subdivide and develop. Pasture for horses or cattle. Space to ride those horses or Atv's. A pond for fish and ducks, timber to hunt whitetail deer, turkeys, and small game. As you can see from the aerial photos the timber has been harvested within the last decade, but a quick visit will prove that the young timber is alive and thriving, offering an abundance of forage for the ample wildlife that inhabit this farm.